Want to know what is below the ground? Drill a boring. Geotechnical exploration has taken that approach for hundreds of years. But this approach has its disadvantages, the most significant one being the fact that we don’t really know what is between the borings. And what you don’t know that can be a big issue when it comes to construction of foundations. Advancements in technology now provide us a great supplement to the traditional soil boring. Using nonintrusive, geophysical techniques, Terracon can help you understand much more about the subsurface, particularly the variations that occur between soil borings. And these methods are minimally disruptive, fast and, thorough. Geophysical techniques can be used to locate buried objects, chart underground utilities, map faults, and variations in below grade conditions like depth to bedrock. These techniques also help us understand the constructed environment, for example, we can determine the foundation characteristics of large structures such as deep foundations and dams. Understanding how to interpret the data to yield meaningful results and integrate those results with information gained using intrusive methods. Geotechnical engineers and geologists have great confidence in a myriad of methods to explore the subsurface with tools that collect samples and allow us to visually see, feel and perform tests on samples from the subsurface. Our confidence quickly wanes with nonintrusive, geophysical methods. The geophysicist plays a critical role in the larger team that is tasked with characterizing the subsurface. Terracon has over 25 geophysicists across the nation, and we work with our geologists and geotechnical engineers on a daily basis. This deliberate effort to incorporate geophysical tools into traditional exploration is allowing Terracon to create that heightened awareness that is so critical to the proper incorporation of geophysics in projects. Geophysical methods most suitable to each application. 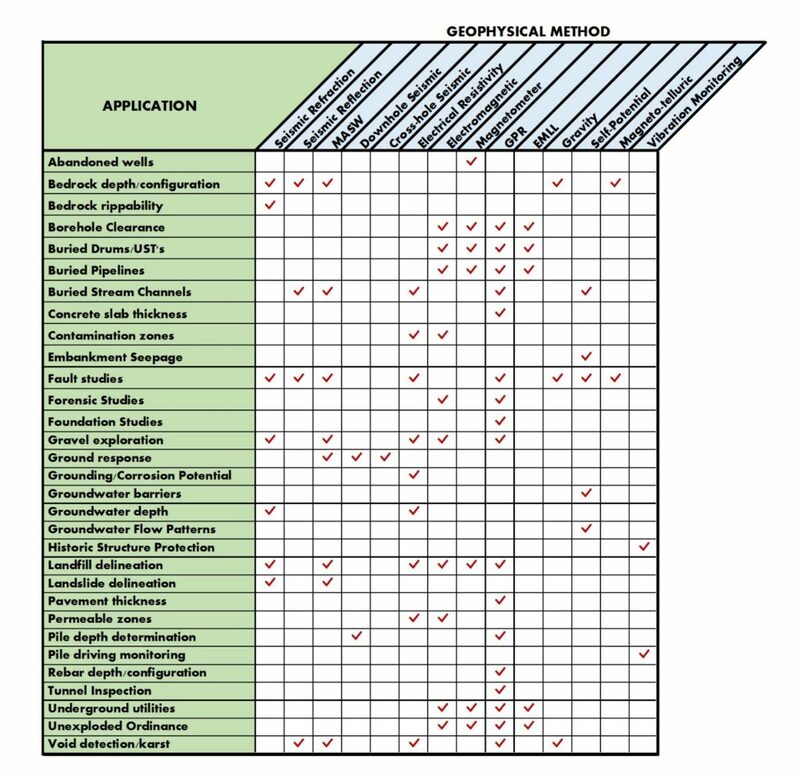 The left column of the Matrix indicates 32 possible applications and the top row lists the fourteen most commonly used geophysical methods that can be employed for these applications. The check marks in the matrix cells indicate which methods are most appropriate for each application. In some cases multiple methods may be advisable. The massive amount of data that can be collected from the various geophysical tools are impressive. Advanced computer software now provides ways to compose colorful data summaries that basically lump together similar properties as recorded by the field instruments and visually display anomalies. At first glance the data appear to show obvious features. However, understanding what this data means for a particular project needs is a critical responsibility that should be entrusted only to trained geophysicists who have experience in the specific geologic setting and with the specific needs of the project. Terracon’s team of geophysicists, geologists and geotechnical engineers work interactively to see below the ground with all that tools that we need. Bill Black is a Senior Geophysicist with Terracon. He has over 40 years of experience in the conduct of geophysical investigations for projects across the nation. Bill has pioneered the advancement of geophysical methods to determine subsurface characteristics for geotechnical, water resources and environmental applications.